Steve Roslonek aka Mr. Steve/ SteveSongs, has been writing and performing his award-winning music for kids and families for nineteen years. Steve blends participatory songs, clever stories and great melodies to create what the Boston Globe called "not just a musical journey, but an entertaining, interactive and educational one." A bright star on the national kids' music scene, Steve has delighted audiences throughout the country at such prestigious venues as The Geffen Playhouse in Los Angeles, Symphony Space in New York City, Fenway Park in Boston, Wolf Trap in Vienna, VA, and the Kennedy Center and the White House in Washington, D.C. 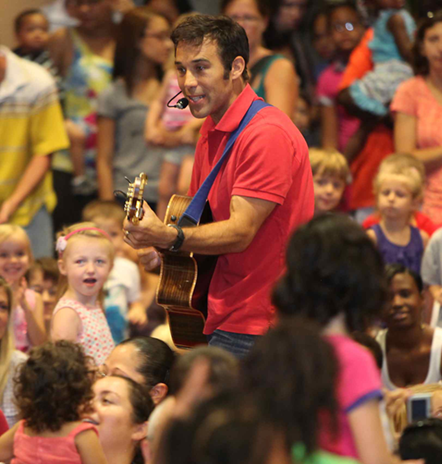 Anyone who’s attended a SteveSongs concert appreciates Steve’s ability to connect with his audience – from the exuberant children flocking toward the stage, to the moms bouncing babies to the beat, to the parents and grandparents singing and grooving along. It’s no wonder he’s been called a modern day Pied Piper! Mr. Steve will play three 30-minute shows each day; each show will have a theme.